Hi! Sebastian here, game designer for TeamCrew. Today, I would like to adress one of the design challenges Frog climbers have provided Team Crew with, which is player interaction. I am going to describe our initial goal and vision, the problems that rose, and the solutions we have come up with and things we are thinking of incorporating. My hope is to give you a view into the design challenges that comes with designing even relatively simple games. 1. Players unequal in skill should still enjoy playing together. From my experience, this means that the lead player should never feel the need to slow down for the bottom player or feel pity for them. Instead, we aimed to replace that pity with a burning hatred, putting coals in the competetive fire that is Frog Climbers. 2. Players should constantly interact. It was discovered early that one of the strongest aspects of Frog Climbers is managing to grab onto a friend, pulling them down as you reach fro grips above them. Increasing these moments seemed like a good idea. Catch up mechanics in action! Overall these goals means that we want both players to be roughly on the same height at all times as they attempt to get further up. Now that I have defined the goals, I will go into some of the solutions. Never give the player at the top an advantage. To encourage player interaction, we want the bottom player to catch up, creating this rule. Due to this rule several planned features were cut. For example, it was planned that some grips would come loose when grabbed, turning into throwable rocks. A player hit by a rock would lose their grip or be stunned for a period of time. However, since throwing downards is easier than upwards this feature would have benefited the top player, so it was cut. Give the player at the bottom several options to catch up. A. Most importantly, the player behind can grab onto the top player’s legs. From there they can grab the opponents knee, then backpack, and then the grip the opponent is grabbing. The player at the bottom gets to the same grip as the leading player, evening the playing field. This also makes it harder to get ahead as a player since you can be dragged down by a mean friend, making sure there is a tangle of player interaction once the players are at the same height. B. The respawn system. Initially Frog Climbers had limited lives. If one fell down, that was it and the remaining player would win. This was the opposite of encouraging player interaction since a player could potentially leave the game befire the race was over. Since featuring infinite lives would not neccesairily ruin the fun for experienced players, we decided to do so. The respawn system is also very forgiving in that it drops the losing player just out of reach of the leading player’s legs, giving them a chance to catch onto the legs if they are quick enough. C. A kind bee for the beeginner. When the distance between the leading player and losing player was too great for the losing player to catch up, something to give them a boost upwards and get them back into the game was needed. Thus, when the game detects that a player has been far behind for a period of time, it spawns a fly on the lower part of the screen, moving slowly so that the player behind can easily grab onto it. When grabbed, the fly heaves the player behind upwards, taking them to the height the leading player has. So! Those are some of the ways Frog Climbers have been balanced to encourage player interaction. I think the biggest lesson to be learned from this is that Frog Climbers was designed for fun, rather than competitive gameplay. 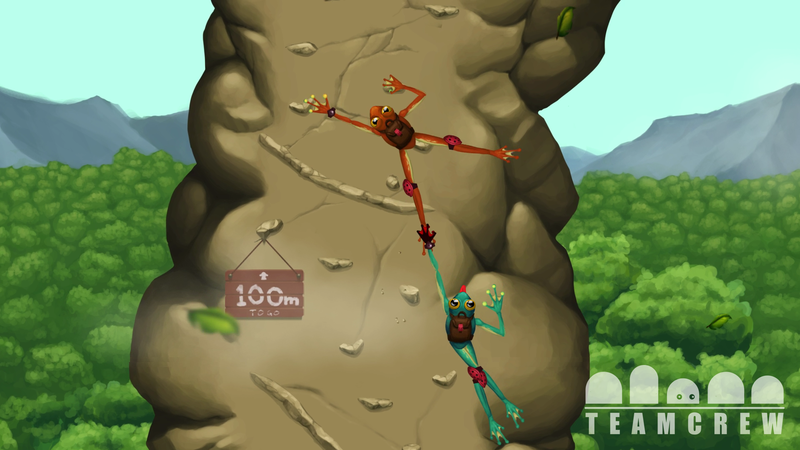 Frog Climbers constantly works against skilled players so that players unequal in skill can play together and still have fun. One could argue that it is an unfair system, and they would be right. On the other hand, it has also proved to be a very fun system. The game does run the risk of making experienced players feeling unfairly treated, which is something we will need to look out for in the final weeks of development.